Transport virtually any make or model of walk-behind outdoor power equipment with ease on any vehicle with a 2″ receiver hitch. 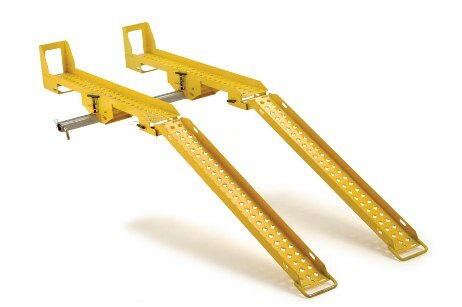 adjustable width ramps will safely transport equipment with wheel spacing up to 35″ in width and up to 46″ front to back. offers rental customers an easy take home option and commercial users the ability to carry auxiliary equipment on small service vehicles or the rear of multi-machine flatbeds. Choose a transport system constructed of rugged steel (EZ100S) or a lightweight steel/aluminum combination (EZ100A). Both come with a two-wheel custom transport and storage cart. Approximate shipping weight: EZ100S 155lb. ; EZ100A 100lb.